I have been a fan of dry rosé wines for years, and now it seems like the rest of the country has caught up to my tastes. Gone (mostly) are the sweet, simple dry white zinfandels that were made when growers couldn’t sell all their zinfandel grapes. Instead, winemakers are producing complex wines with nuanced flavors and crisp acidity. And they are using many different varietals. All the big wine companies are developing a rosé, and many of them are excellent. But often you can find spectacular wines from smaller wineries. 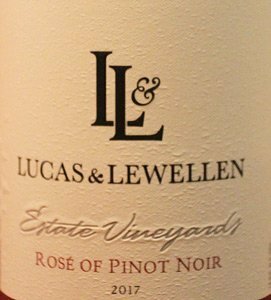 The rosé of pinot noir from Lucas & Lewellen is one of the best I have had in a long time. It is a beautiful deep pink color in the glass, with enticing aromas of strawberry, raspberry, rose petals and a slight minerality. Raspberry, strawberry and cherry flavors come alive with the first sip and keep on coming. This is not a wimpy wine. The crisp acidity balances the ripe fruit flavors and leads to a long, smooth finish with just a hint of sweetness. The wine tastes like a pinot noir and has all the complexity of a good pinot. It comes in a clear pinot bottle with a screwcap, so this is a great wine for picnics or boat rides on the lake. The taste is not bone dry; there is hint of sweetness to make the wine even better with food. The grapes are 94 percent pinot noir and 6 percent viognier. They were hand picked in the morning, crushed and soaked overnight in stainless steel tanks. Contact with the skins allows the wine to pick up the slight pink color. The grapes were lightly pressed the next morning and the pinot and the viognier underwent cold fermentation together. The grapes were picked in the fall and the wine was bottled in December without any time in oak, so all the fresh flavors burst through. This really is a delightful wine. The company also produces an outstanding sauvignon blanc that is loaded with tropical fruit flavors such as Meyer lemon and white peaches, accompanied by guava and pineapple aromas. Both of these wines are perfect for sipping during the warm days and nights ahead. Lucas & Lewellen grapes are all sustainably farmed and hand picked from four estate vineyards in the three principal wine grape regions of Santa Barbara County: Santa Maria Valley, Los Alamos Valley and Santa Ynez Valley. The grapes for this wine come from the Goodchild Vineyard in Santa Maria Valley and the Los Alamos Vineyard. The grapes are four distinct clones, two from old California vines and two grown on vines brought over from Burgundy, France. The cool-climate Goodchild Vineyard consistently produces outstanding pinot noir and chardonnay. The soils vary from clay and gravel river deposits to hillside and hilltop sites reminiscent of the great vineyards of Burgundy. 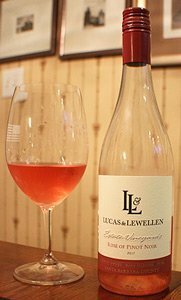 Winery: Lucas & Lewellen is the story of two successful people following their passion. Louis Lucas was a third generation grape grower when he met Superior Court Judge Royce Lewellen in 1975. Both were part of the Santa Maria Wine & Food Society. After a few meetings they started to enjoy each other’s company and found out they shared a passion for good wine and a vision for the Santa Barbara County wine region. As the friendship grew they talked more about what they saw as the high potential for Santa Barbara wines. From his two vineyards Lucas had supplied premium wine grapes for top Napa and Sonoma wineries for decades. When he called Lewellen and invited him to lunch one day in 1996, he said he was considering selling one of his two vineyards. Lewellen said he didn’t want to buy a vineyard, but he would buy half interest in both vineyards if Lucas would do the farming. By the end of the lunch, the company was born. The two vineyards were the Lucas Brothers’ Los Alamos Vineyard, a fully planted and productive 88 acres, and the Goodchild Vineyard, 100 acres that had 20 acres of exceptional chardonnay, plus plantings of kiwis, blueberries, apricots and plums. Soon pinot noir and chardonnay vines were replacing fruit in the Goodchild Vineyard. A year later the company bought Valley View Vineyard near Solvang. The Lucas family moved their home to a site overlooking that vineyard. Lucas improved the vines there and planted more vines on every available piece of land. In 1998 Lucas & Lewellen bought a neighboring vineyard in Los Alamos that was already planted in 19 different grape varieties. Lucas also went to work on this vineyard and planted more vines. The partners started off cautiously, making their wine in other people’s wineries. Then they hired a consulting winemaker and built their own state-of-the-art winery in Buellton. Tasting rooms in Solvang came next, and in 2006 they hired Megan McGrath to be their winemaker. The Solvang-based winery now has 400 acres of estate vineyards situated among three of Santa Barbara County’s distinct climate zones. They have three major wine labels and two tasting rooms in downtown Solvang. Their valley vineyards benefit from a rare transverse mountain range topography, an east-west orientation which channels the cool ocean air of the Pacific into the coastal valleys, allowing warm days and cool nights to produce a long, gentle growing season. The winery produces sauvignon blanc, viognier, riesling, chardonnay, pinot noir, syrah, merlot, cabernet franc, cabernet sauvignon and port under the Lucas & Lewellen label. A number of Italian varietal wines are made under two other labels: Madolina and Toccata. 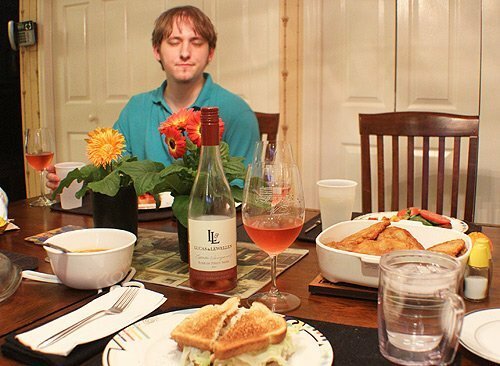 The Lucas & Lewellen Rosé of Pinot Noir was a nice match for a BLT and potato pancake. Goes with: We had this wine with a nice, light spring supper: bacon, lettuce and tomato sandwiches with potato chips. I added potato pancakes because it was one of those things I just had a taste for. The rosé was perfect with the BLTs. The wine had plenty of fruit and body but it never overpowered the food. And then when I had a couple of potato pancakes the wine was bold enough to hold its own with them. Pinot noir grapes produce wines that are well-suited for food, and the rosé is lighter and a touch sweeter than most full-bodied pinots, so this could be your go-to wine for light summer suppers. It will pair well with all kinds of chicken dishes, fried or steamed shrimp, grilled fish, and even heavier fare such as hamburgers and lamb chops. It would be difficult to find an occasion when this wine wouldn’t fit right in. Pancakes sizzling in the pan. Now grate one medium-sized sweet onion, also squeezing out the liquid. Add salt and pepper to taste and mix the potato and onion with just enough flour to help the pancakes stick together. You don’t want to use too much flour because that will hide the potato flavor. Pour peanut oil or vegetable oil in a frying pan, about 1/2 inch deep. Heat the oil over a medium heat. Form pancakes about the size of your palm and as thin as you can make them without falling apart. 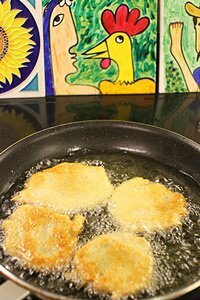 Slide the pancakes into the hot oil and cook until light brown on one side, about 5 minutes. Turn the pancakes over gently and brown the other side, about 3-4 minutes. Do not overcook. Remove from pan and keep warm until read to serve.